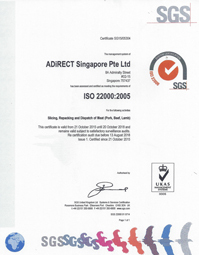 Meatlovers powered by ADiRECT Singapore are certified to the ISO 22000:2005 international quality management system accredited for our Food Safety Management System which meet food industry expectation. 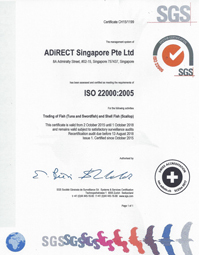 Our ISO 22000:2005 certification affirms our successful pursuit of quality and service excellence. The management system designed to enable us to control food safety hazards along the food chain in order to ensure all our products are safe at the time of consumption.